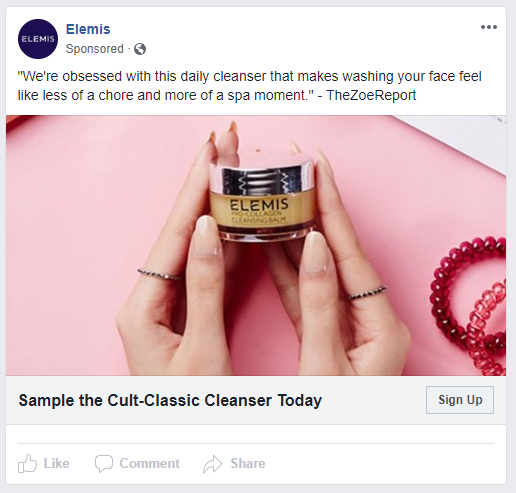 Get a free ELEMIS Pro-Collagen Cleansing Balm sample for a limited time only. Request it below over on Facebook! On a mobile device? Try this link instead, you may still need to switch to Desktop Mode to see it though. Can’t find it? This is what it looks like. Scroll down until you see the offer post (it may need to load a few pages before you see it). Then click the “Sign Up” button in the Facebook post (if you can’t see it on mobile try requesting a desktop site or the deal might just be over).